-There is a 28 Night Minimum Rental Requirement. Contact property managers if interested in renting less than 28 nights during April-Dec. time period. **New bedding & decor in bedrooms & bathrooms since pics taken...notations made under each pic....inquire w/reservations for updated phone camera pics. 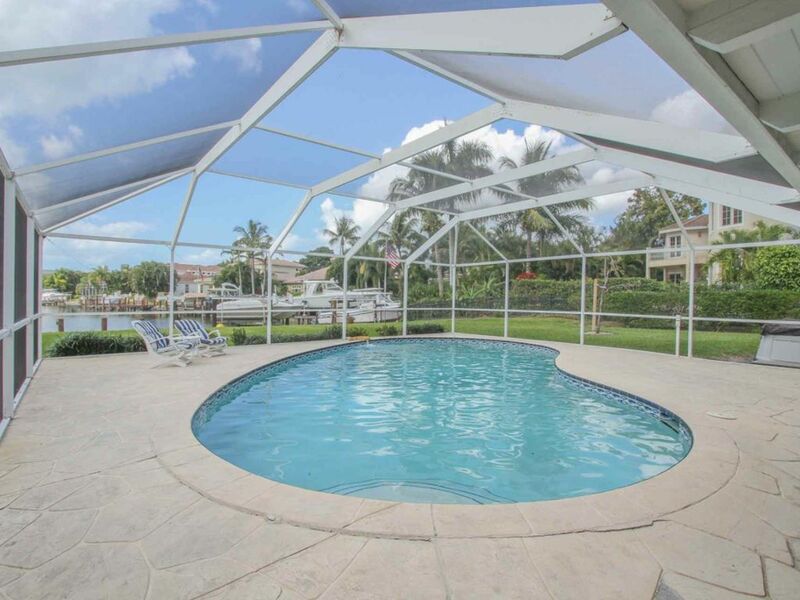 LOCATION, LOCATION, LOCATION…….says it all for this WATERFRONT 3 BR/2BA single family pool home with boat dock located directly on Compass Bay in the highly sought after community of the Moorings!! . This property is all about LOCATION & VIEWS!! You couldn’t be more centrally located in a more sought after community than the Moorings. Hawser Lane is convenient to everything that Naples has to offer. This private residence is around the corner from Mooring Line Drive and only 1 mile from Lowdermilk Beach Park. It's also just a short distance to Naples Beach Hotel & Golf Club, which offers public golf, spa/fitness facilities for a fee and live music & dancing under the stars on Sunday nights. You can literally walk or bike to these locations. This vacation retreat sits on an oversized lot with views of Compass Bay from the expansive screened lanai surrounding the private in ground pool (unheated). The outdoor space & view alone establish this property as a true “vacation oasis”! The Living Room boasts a leather sofa & flat screen TV mounted on the wall. The breakfast nook area in the Kitchen provides a 4 seat table for your indoor dining pleasure. Direct pool access via sliding glass doors from Living Room & Kitchen. There's also a outdoor gas BBQ grill and patio table & chair set for dining al fresco. The West facing property views afford guests the most amazing sunsets! This single story home provides a split bedroom floor plan for the ultimate in privacy. Master suite, located directly off the kitchen, houses king bed & en suite bathroom with tub/shower combo. Direct sliding glass door access to pool from the Master suite. Guest Bedrooms (2) are on the opposite side of the house, off the Living Room, with a full bathroom (standard tub, separate shower & dual sinks) located in between the two bedrooms. Guest bedroom with King bed (blonde furniture) has direct access to the pool, while the other guest bedroom houses a Queen bed (wicker furniture). There is even a Billiards Table in the home for your enjoyment! Don’t delay in making your reservation today…..”paradise awaits” your arrival in gorgeous Naples, FL!! The monthly rental rate is based on a 28 day month. We really enjoyed the area, the view and the lanai. Two master bedrooms as well as a pool table for rainy days were also a plus. I will also say that Tammy was great to work with. She was always very prompt with responses and helped us out with any problems we had. I am only leaving 4 stars versus 5 merely based on the fact that there were a few things that would have made it close to perfect. I was not concerned about the updating of the house as it was clearly shown via pics and description. I do feel however, a vacation spot should have an ice maker and the oven should be calibrated as not to have to use a thermometer and hope it stayed at desired temp. The grass length needed attention and the missing flap on garbage disposal rendered it unusable. It would also be helpful to have the pool water pump discharge to be dropped below the water line as the noise it created throughout the day was a little unpleasant. Despite the minor "flaws" I mentioned, it is a great vacation spot for those who enjoy the Moorings area. We had the great pleasure of staying at this Moorings home in late April. The pictures and descriptions clearly describe an older home. It’s true. But... this home is in a perfect location exactly where I wanted to be. It is large, spacious and clean. There is not a thing we needed that wasn’t available in this home. We spent all day every day outside until after the sunset, then off to dinner and then back to play pool. Pool table really is a fun feature. We are a family of 4 with adult children. We have family nearby so it was wonderful having the large entertaining space both inside and out! We try to get to Naples every year or 2, and will definitely book with Tammi and Neil again. They were excellent, accommodating and available if necessary.cant wait to get back to “the Moorings” house. This home is everything we expected and all we could have asked for. It is not modern, but it is very clean and well appointed. The location is perfect - quick walk/ride to the beach, nice neighborhood for a morning stroll, and close to the shops. Our family of 5 has plenty of room to spread out, and we have enjoyed endless rounds of pool late into the night. The pool is nice, though would be more enjoyable if heated. Tammy was very prompt with answers to my questions, and making sure we had everything we needed. We would definitely stay here again if our travels bring us back to the Naples area. Had a great time at the Hawser Lane home. Great location. House is nice but needs upgrades and modernization's. Itrip Vacations and the Novaks were great to deal with. Wouldn't hesitate to book again with them. I recently rented a home in Naples for my son and his family. It was a late notice and many properties were already taken within our budget. I called Tammy and Neil and Tammy found an older home that we could rent. She was very upfront with the condition of the home. She even let us go in and take a look at before hand. After my son arrives the microwave quit and we sent an email to Tammy. The very next day she delivered a new microwave. We really appreciated her thoughtfulness! She did this all while she was helping another customer by doing their laundry. Their washing machine quit at the rental home. Not many rental managers will go to those extremes to help make people's vacations a great one! Again we really appreciate all of their help and would definitely rent from them again! The home was reasonably appointed bearing in mind the current owner has spent very little in maintenance. Or bring it up to date. It was obvious that owner is trying to sell the property as a redevelopment site. The kitchen was a little basic and the oven was very dangerous. We would suggest that all the white goods with the exclusion of the fridge/freezer are replaced. Recommend the pool is up graded with a heater system .The water circulation pump failed during our last few days. Location is fine with excellent Su set views. Major Credit Cards Accepted. Monthly rates show the rental amount of a four week trip. A 35% deposit is required upon confirmation of all reservations. Local, State & Federal Taxes 11%. Processing/Reservation Fee 3.4%. Refundable Security Deposit $1,000 per trip refundable after cleaning and inspection. 10% Discount Off Base Rental Rate.